I shared my post on how we chose our flooring for the house and you can read it here. Today I will be sharing with you how we installed the laminate flooring and the skirting boards. As we were changing the floors, we also got the chance to change the old skirting boards. I got offered to work with The Skirting Board Shop* and I could not be happier we chose their products! The Skirting Board Shop offers a wide range of products – sizes and finishes, which makes life so much easier. 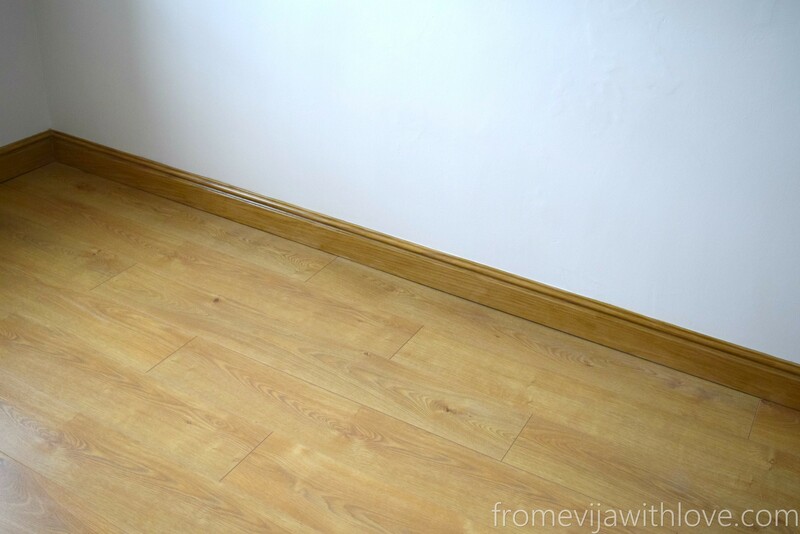 As we had a beautiful oak laminate flooring, we opted for this gorgeous Torus Oak Veneer skirting board. It was unfinished, but I was planning to use a stain to match our floors! Even if we decided to paint them we could paint them in any colour or finish. The first room getting our new floors was my office space/craft room! After the ugly old carpet and the bare floorboards, I was SOOOOO excited to finally have proper floors installed! My father-in-law did most of the measuring and cutting (well almost all of it!). I did try to help though! For this project we used Selitac Aqua-Stop Parquet and Laminate Underlay . Once the underlay was laid, we put the floor boards over the top, the boards simply would click in place. The tricky bit was to measure and make sure it fitted around radiators and door frames. Once the floor was laid, we measured and cut the skirting boards. We put them on the walls using some no more nails, it was quick and easy(ish)! Unfortunately, some of the walls were not level so the angles didn’t work out 100% as we intended to, but the good old wood filler did the job! I filled any gaps (from the wall) with caulk and wiped using a wet sponge. I then stained the skirting boards to give them the finish I was after. I chose this stain in Natural Oak by Ronseal. Here is what our beautiful floor looks like now! I am extremely happy with the way the flooring looks and the skirting boards just beautifully finish the whole look don’t you think? *Disclosure: This post has been made in collaboration with The Skirting Board Shop, and the skirting boards for this review have been provided to me free of charge. You can view our full policy here. All opinions and ideas expressed are my own and not influenced in any way. ** This post may contain affiliate links. You will not be charged extra for the products if you click & purchase through the links provided, however, I may get a small fee for it. You can view our full policy here. It really does look super nice & I know you will enjoy the new room! Thank you Florence! I love love love how it turned out! !